As Pixar has been working to re-establish it's dominance on the world of computer animation Walt Disney's own animation house has been turning out both commercial and critical successes one after another since the 2010 resurgence of Tangled brought the Mouse House firmly into the twenty-first century. Followed up by the likes of Wreck-It Ralph, Frozen and last year's Big Hero 6 the studio looks to continue their streak by going back to a formula that has always seemed to be a reliable staple of children's entertainment: talking animals. With Zootopia we have a world that is being called a "modern mammal metropolis" and features the likes of a fast-talking fox, Nick Wilde (Jason Bateman), who's trying to make it big and goes on the run when he's framed for a crime he didn't commit. Zootopia's top cop, a rabbit named Judy Hopps (Ginnifer Goodwin), is quick to jump on the suspected criminal's tail trail, but when both become targets of a conspiracy they're forced to team up and eventually discover that even natural enemies can become friends. Like with Big Hero 6 Disney's marketing team have chosen to go the route of releasing what is more or less a clip from the film rather than a traditional trailer. The scene we are treated to has a hilarious spin on DMV's with the reassurance that no matter what world we're in it's always as terrible an experience as one can imagine. Zootopia also features the voice talents of Shakira, Idris Elba, J.K. Simmons, Nate Torrence, Jenny Slate, Tommy Chong, Octavia Spencer, Alan Tudyk, and opens on March 4, 2016. 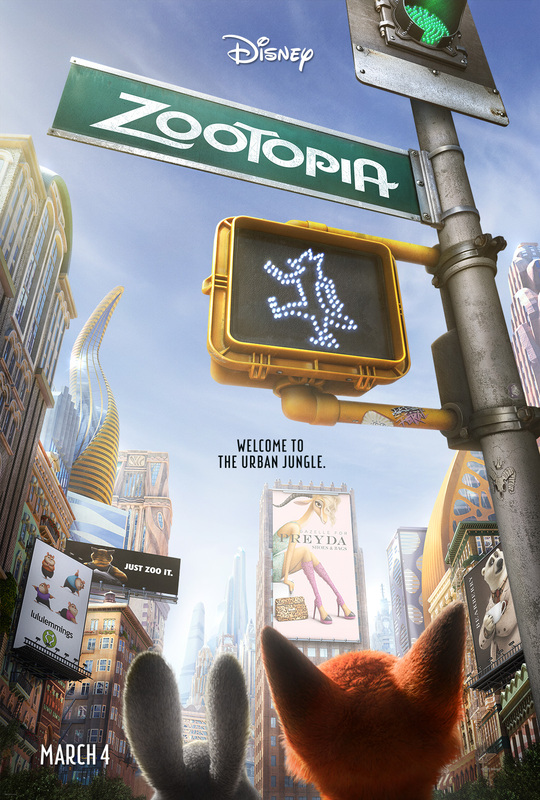 Synopsis: The modern mammal metropolis of Zootopia is a city like no other. Comprised of habitat neighborhoods like ritzy Sahara Square and frigid Tundratown, it’s a melting pot where animals from every environment live together—a place where no matter what you are, from the biggest elephant to the smallest shrew, you can be anything. But when optimistic Officer Judy Hopps (voice of Ginnifer Goodwin) arrives, she discovers that being the first bunny on a police force of big, tough animals isn’t so easy. Determined to prove herself, she jumps at the opportunity to crack a case, even if it means partnering with a fast-talking, scam-artist fox, Nick Wilde (voice of Jason Bateman), to solve the mystery. Walt Disney Animation Studios’ “Zootopia,” a comedy-adventure directed by Byron Howard (“Tangled,” “Bolt”) and Rich Moore (“Wreck-It Ralph,” “The Simpsons”) and co-directed by Jared Bush (“Penn Zero: Part-Time Hero”), opens in theaters on March 4, 2016.